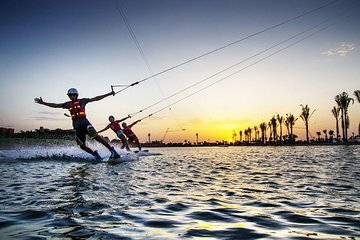 Hit the water at Waky Marrakech Cable Park for a coaching session on a wake-board, wake-skate, knee-board, or water-ski. Two cable circuits with two different speeds mean that you can pick your terrain and difficulty, whether it’s your first time at a Cable Park, or you’re a more experienced rider ready to practice your skills on kickers, sliders, and boxes. Had a great time at the Cable boarding marrakech. Well organised, lovely stuff and good food. I would like to say a big thank you to all the stuff and special thanks to our tour guide for the day. My friends and i really enjoyed the waky marrakech. What fun! Phenomenal experience. Highly recommended. Would thoroughly recommend this trip. Amazing!! !